It’s been two months since my last post. Oops! I dropped my commitment to regular blog posts to transition back home where I hosted a house guest for several weeks, during which I bought a new laptop which failed shortly thereafter and then went through the process of transferring all my files a second time just as I started a new contract from home. Frankly I’m in disbelief that it’s been two months. All of that is not much more than the excuses that are the enemy of writing. Getting back to WordPress today has been a fight but one worth winning. To make it easier I am taking advantage of the porch I cleaned up to enjoy my outdoors, bringing my new laptop out with me, and accompanying my effort with a glass of homemade lemonade. I recommend making everything as delightful as possible to break through the non-motivation barrier when writing! During this transitional time, I am happy to share that my search for book reviewers paid off with a great review on a summer reading blog here. Sharing the review garnered much support and interest as hoped. In related news, my time with Amazon Kindle Unlimited has expired. 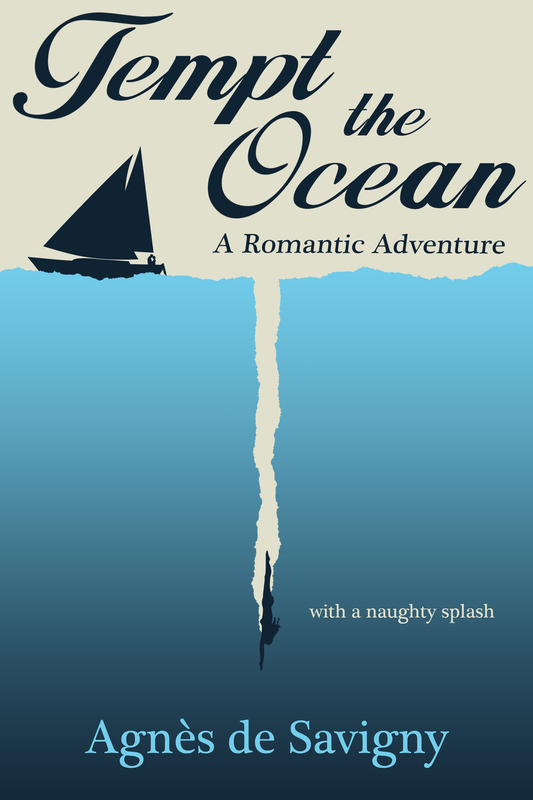 I can’t say that the exclusive publishing with Amazon did anything special for Tempt the Ocean, and I’m looking forward to expanding the novel’s market to other outlets such as Smashwords, Apple, Kobo, Barnes and Noble, etc. I am saving the second round of publishing for when my contract is over, but stay-tuned for updates and promos. While bouncing around the files of my current novel, I experienced a tiny epiphany as to the restructuring it required, and now know how to get from the second half of the middle to the beginning of the third act, which is already written. I’m relishing getting into the guts of mid-18th century New York, and my pair of star-crossed lovers. Add in 1 cup of hot water and stir gently until sugar dissolves. Weeks of thumbnail sketch designs and stock photo downloads and image file searches and Photoshop filtering and colleague input have led to this: a final cover design. It’s not what I started with, but is a second stab starting from scratch and following an idea I didn’t go for the first time around. But I like it. The design is clean, simple, graphic, and edgy. There is a nod to both romance and risky adventure in the imagery. The visuals lure the reader. I went through colour charts and photo layers and a more traditional Romance genre cover before I scrapped it all and got to this. I had thought about developing three different covers and putting out a poll to get some feedback, but this version is so far superior to the others that I’ve gone ahead and decided myself. Yes, the cover is non-traditional, but so is the romance. The solo diving figure reflects the first-person POV of the novel. The diving down to the unknown reflects the dangers the protagonist faces, often alone. I’m very excited with the bold look. Next step is to get the cover, the manuscript, the descriptive blurb, an exciting excerpt, and the author bio all up to the Amazon site and announce a release date! Last weekend I sat down and created a Facebook page to help promote the new book. The page doesn’t represent the book itself but rather represents me as an author. This allows me to promote this first novel and then myself, and then any future publications as well. 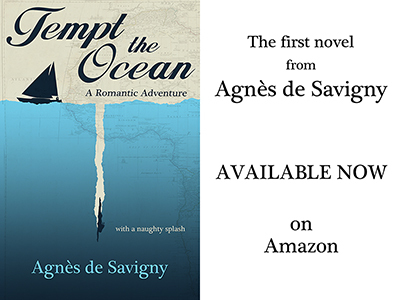 I’ve written my romance under a pseudonym, Agnès de Savigny, so I created the author page for her. I act as administrator. And act as Agnès if necessary. This posed an interesting challenge when I realized that I had to face up to writing the bio for my pseudonym. What is pseudonym biography protocol? Can I make everything up, since Agnès doesn’t really exist as a person? Although there is no real Agnès de Savigny, she is in effect, me. The best advice I came across was to use elements of my own life experiences that support the content of the novel—i.e. what can I say about myself that would let potential readers know I can write well about the subject matter I do? I spent days going over what that could be until I woke up the one morning knowing exactly what to write. Facebook buries the bio halfway down the “About” tab of the Author fan page, but now I have a bio I can use for the back of the novel and for the author page that I will have to create with Amazon. Meantime, work continues on the cover of the novel. The decision to take on the design on my own slows down the process due to lack of available free time. But I have a font I like, and I developed a pair of hand-drawn letters for the title characters (that’s “characters” in font-speak, not literary-speak). The images need more work, and until that gets resolved I can’t publish. But I am getting close!